We often forget to catch kids being good. Kids respond great to positive feedback, and sometimes positive comments can give kids enough motivation to change their negative behavior. 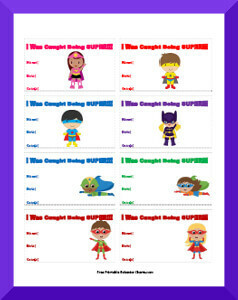 Our "Caught You" Coupons are fun ways of rewarding kids for their good behavior. When you catch a student behaving positively, give her a coupon and let her know why she did a great job! Kids can even save up their coupons to trade in for other incentives. Remember, if you'd like us to make up some "Caught You" Coupons targeted for a certain behavior, just drop us a line and we'd be happy to make some up. Check out our additional "Caught You" Coupon page.